SAMHSA recently reported that employees in restaurants and hotels have the highest rates of substance use disorder out of the entire American workforce. Anne looks to combat this by offering a variety of opportunities and initiatives to support her employees and company culture. Keep reading to hear Anne’s thoughts on trauma, mental health and the responsibility of employers to create a safe environment for their employees. A: I grew up in Grand Forks, North Dakota. I am the youngest of three with two older brothers who used me for target practice by shooting frozen tennis balls at me in the hockey net - thus my stubbornness and grit. I graduated from the University of North Dakota with a BA in economics and a law degree. I practiced law for 7 years before we moved to London where my husband opened the European office for his company. We spent 5 years in London and our two oldest boys were born there. My children will attest that I am a “horrible cook”. My early food influences included pizza, fast food, and TV dinners. I am an unlikely candidate for the restaurant world, but I fell in love with the power of food, culture, and community, such as gathering around long tables, while residing in London and traveling abroad. After returning to Minnesota and becoming a busy mom of three young boys, I saw an opportunity to provide artisan pastries, breads and meal options for other busy families, professionals, and empty-nesters in a comfortable and welcoming environment. The Lynhall is more than a restaurant; it is a collective of passionate educators, chefs, bakers, craftspeople, storytellers, and entrepreneurs. Q: How did your experience practicing criminal justice influence what you're doing today? A: Compassion. Empathy. It provided context for the daily struggles so many people are facing while dealing with their trauma. Q: What role do employers have in supporting the health & wellness of their employees? A: I have come to find there is a fine line between offering opportunities to employees and walking alongside them as they find their path versus imposing my beliefs on them. For instance, we offered a nutritionist to our Management Team in hopes that they could tackle their struggles with mental health from a nutritional perspective. However, only two people followed the recommendations, and it wasn’t the people who we thought could benefit the most from the opportunity. Nonetheless, I will continue to offer these types of opportunities for my employees. At the end of the day, we are all just humans and creatures of habit. It is up to us to decide when we are ready to dedicate ourselves to our own health. Q: What are the barriers that prevent employees from accessing traditional support services? A: Hands down cost and time. We offer health insurance and even if our employees elect to take it, they still complain about the high deductibles. In addition, our employees often have multiple jobs so they cannot access traditional services that have office hours during the workday. That is why we are exploring alternative paths to support our employees so they are armed with the tools to "be their own healer", as my mentor Suzanne Koepplinger preaches. This is also why we are so excited about Recovree and their efforts to connect employees to a coach who will meet them where they are at during their hectic lives. Q: When it comes to substance use disorder and mental health, what responsibility does the hospitality industry have in being part of the solution? A: I believe regardless of which industry you work in, all employers have a duty to determine whether their work environment is safe. Not just safe in the physical sense, but in the mental capacity as well. What does that look like to me? It means consistency in scheduling, clear communication and banning gossip in the workplace. We need to support our employees when they stumble by providing a safe space where they can share their struggles without recrimination and develop a plan of action. So often we find it is as simple as providing a safe space to talk. Q: How can we, as a community, change our approach to how we deal with trauma? A: I believe there is still a lot of confusion about what trauma is. Most people think of PTSD or a gunshot wound when they hear the word trauma. I certainly didn’t fully understand until I learned about it through the Mill City Kids Initiative. I had the opportunity to see how much historical trauma many groups, including the indigenous, black and certain religious communities, have suffered through. I think it starts with offering opportunities for people to convene and learn about trauma. Last year we hosted a Nourish Series Event about “The Human Impact of Trauma” which addressed how trauma shows up in the restaurant industry. This spring we plan to offer another event, “Mental Health First Aid Class”. Empowering people with knowledge to help them understand trauma can be very profound. Q: How do you think food, community, and health are related? A: My mentor in the children's mental health work, Scott Harman, would repeatedly say, “It's all about being in relationship with one another. It's all about the power of relationships." The longer I am on this journey I appreciate even more the power of human connection and being in relationship with one another. Sadly, the disease of addiction attacks relationships, which we are all seeking, and in turn leads to greater isolation. We hope that at a minimum our welcoming, warm space and communal dining areas combat this feeling of isolation that so many struggle with today. We hope that by offering our space to Ben's Friends, a restaurant industry support group, and the Nourish Series events, we can offer opportunities for people to learn alongside one another as we find greater compassion. We will continue to raise the profile of how many are struggling in our industry. Ticket sales to our Nourish Series events benefit The Long Table Fund, which works in partnership with the community to connect and empower those in the restaurant industry affected by trauma, mental health issues, and chemical dependency. 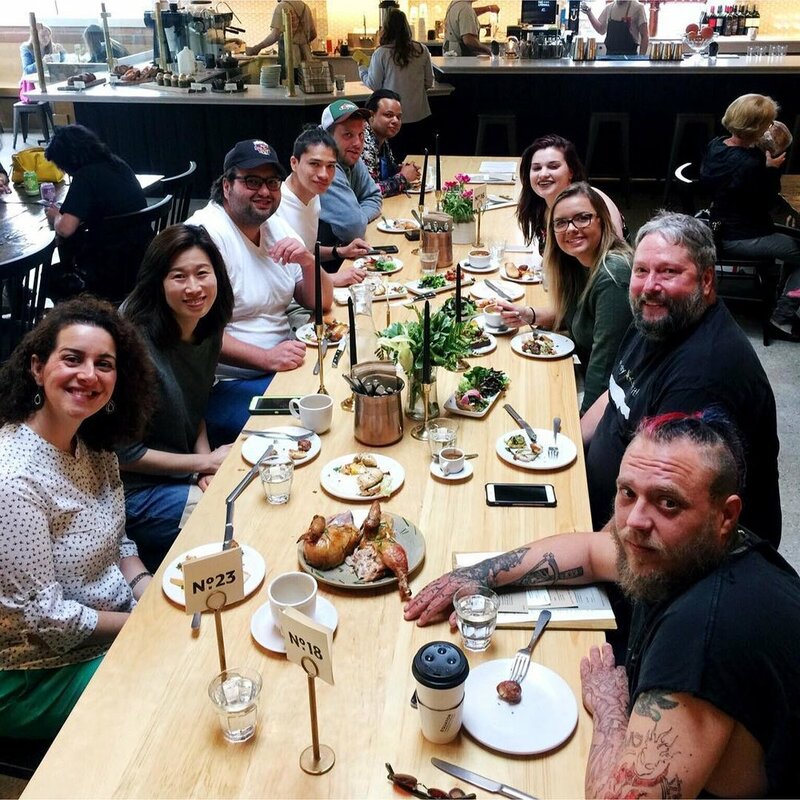 Proceeds of The Long Table Fund will provide mission-specific educational opportunities and increased access to crisis mental health care for members of the restaurant industry. It is through these efforts that we can offer access to Recovree Coaching Services for our employees.